Keeley Ainge is a Delta Secondary School graduate, where she actively participated in basketball, club volleyball and community soccer. At approximately 10 years of age, she began playing softball. She had been strongly influenced to pursue the game after watching her parents play slo-pitch. She realizes today that if she had not taken advantage of the opportunity to play, she would never have achieved her full potential or level of accomplishment in the game. Keeley has played on many Rep Softball teams. Collegiately, she signed to play softball for the Douglas College Royals in September, 2014. Prior to this, she had been offered a full ride scholarship to Western Nebraska University and a partial scholarship to a college in New York. 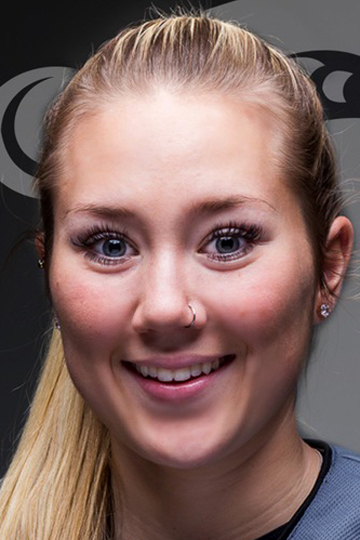 Since arriving at Douglas College, she has been utilized primarily as a Pitcher. Her 2 years have been nothing short of dominant. In 2016, she registered a won-loss record of 17 and 5, combined with a 3.24 Earned Run Average (ERA) in 128 innings pitched. She was selected as a NorthWest Athletic Conference (NWAC) 1st Team All Star as a freshman as well as a NWAC 1st Team Championship Tournament All Star. Keeley improved on these achievements as a sophomore in 2017. Her won-loss record was 21 and 4 (17 and 0 in league play). She repeated as a 1st Team All Star in NWAC League and Tournament play. She was also selected as the NWAC Pitcher of the Year and, for the 2nd time in school history, an All American. She concluded the season as a Gold Medallist with Team BC at the 2017 Canada Summer Games in Winnipeg. This was a four-peat for Team BC in women’s softball. Keeley was part of the BC pitching rotation with a record of 2-1. During her developmental years, there were two individuals who were her role models for setting goals. Both were pitchers, Danielle Lawrie, who played collegiately for the University of Washington and Team Canada and Jennie Finch, who represented Team USA. Regarding positive influence to career development, Keeley considers Michelle Peters, her Head Coach at Douglas College, as being most instrumental. Keeley’s future plans include Nursing. She is following the BSN program at Douglas College. There will also be a place for softball, perhaps with the Delta Heat ’98.